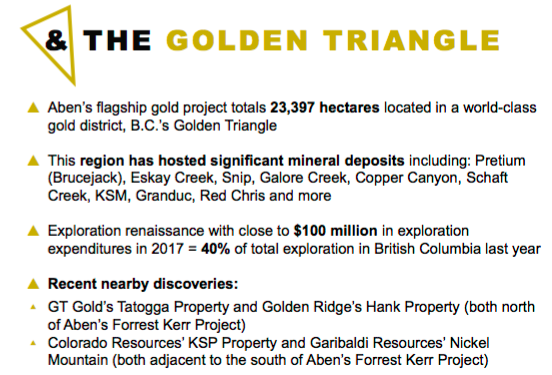 The Golden Triangle (GT) in northwestern British Columbia (Canada) is a tremendous place to explore and make precious & base metal discoveries. It’s known for monster high-grade gold deposits, but also hosts silver, copper & other base metals. When one considers the GT, one might think of Pretium Resources’ new bonanza-grade gold (Au) mine. Pretium has an Enterprise Value of about C$2.6 B. 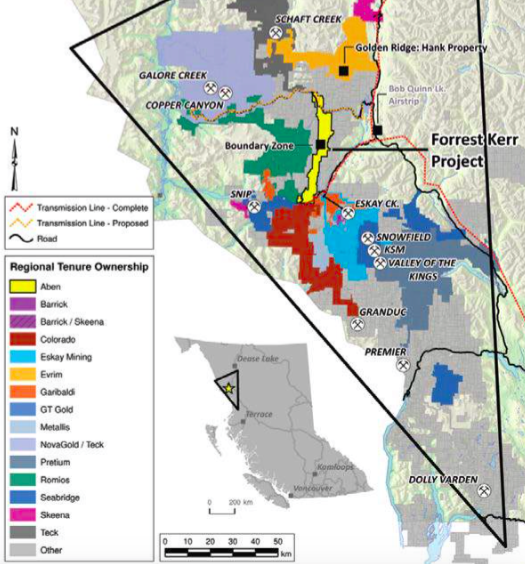 But, there are many prominent players in the GT, including; Teck Resources, Barrick Gold, Goldcorp, Newmont Mining, Antogagasta, Hecla Mining, Hudbay, Centerra Gold, Hochschild, Seabridge Gold, & SSR Mining. Past producing mines include Premier, Snip & Eskay Creek. Other well known mines/development projects include Brucejack, Galore Creek, Copper Canyon, Schaft Creek, KSM, Granduc & Red Chris. Eskay Creek reportedly produced 3.27 M ounces of gold at 49 g/t Au and 158 M ounces of silver at 2,406 g/t. So yeah, this isn’t just a top Canadian jurisdiction, it’s a world-class destination. A very important factor in the GT’s reemergence last year is that to a large extent, success for one player is success for all. For example, Pretium’s (and other’s) development over the past decade led to very significant improvements in critical infrastructure. 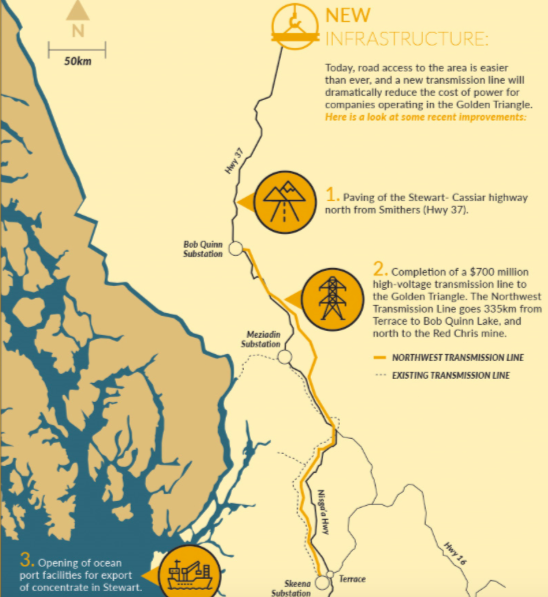 There’s the paving of the Stewart-Cassiar highway (Highway 37) north from Smithers, the Northwest Transmission Line, a C$700 M 344-km, 287-kilovolt power line was finished in 2014 and the completion of a 3 dam, 277 MW hydroelectric facility ~70km northwest of Stewart. Also near Stewart, year round access to improved Stewart deep water ocean Port facilities. Of course, wherever there’s blockbuster discovery potential, one will find dozens of juniors hoping to cash in by controlling land reasonably close to the most exciting (existing and past producing) mines and development projects. The GT has its share of those juniors, many of whom are too small to fund the drill campaigns needed to maximize the chances of making noteworthy discoveries. Readers beware, the GT mints both kings and widows, far more of the latter. On the heals of Pretium’s success in reaching production last year, and exciting new discoveries by companies including GT Gold Corp., Garibaldi Resources, Golden Ridge, Colorado Resources and Aben Resources, the GT is a hot place to be (for at least the third time in its history!). Importantly, Gwen Preston “The Resource Maven” put out a very informative and positive report on Aben Resources last week, causing trading volume and the share price to rise. This is a true vote of confidence from a woman with multiple successes, including her backing of Great Bear Resources—one of the best junior mining stories of 2018. Still, while the potential rewards are high, the risks are well above average because the region is extremely complex geologically. Complex means that, at the very least, considerable time & capital consuming exploration needs to be done. Adding to the complexity is that, due to its far northern location, most of the camps in the GT can only be explored for half of the year. Helicopters are often required to fly manpower and equipment in and out, so exploration costs are high. As mentioned, infrastructure in the region continues to improve, a fact well documented in peer group corporate presentations. In speaking with Aben’s management team, I can add to the narrative — Aben slashed all-in exploration costs this year to approximately C$235/meter from nearly C$400/meter in 2017. Management reports an increasing number of service companies in the GT, helicopter service providers, drilling & equipment contractors, etc., and competition is driving down costs. The company was also able to set up camp closer to drill sites, cutting down on flying time. One of the best things Aben Resources has going for it is its substantial cash liquidity, currently at ~C$7 M. Comparing Aben’s cash balance with that of the peers listed below, notice that it has the strongest cash liquidity relative to market cap. Among the peers I would say at least half need to raise capital in the next few months, or certainly before resuming drilling. By contrast, Aben is funded for its next GT drill campaign. 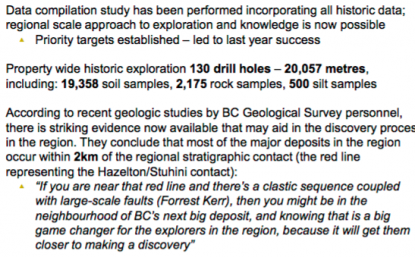 At C$220/meter in 2019, a bit below 2018’s all-in costs, it could do potentially 18,000 m (60-70 holes) for a total cost of C$4 M. That’s a serious amount of drilling, more than in 2017 & 2018 combined. Including the 24 unreported holes from this year, that’s perhaps 80-90 holes that will reported well into next year. Although the share price has been disappointing lately — down to C$0.21 from the mid C$0.40’s in August after the announcement of the first hole of the season — with 24 holes yet to be reported, I think this story could have legs. The weakness in Aben shares came the day after a press release by fellow GT junior Golden Ridge Resources posted news that the market didn’t like, sending that stock plunging. The real excitement remains on the open assays are from the Northern Boundary zone, host of the best results to date. Importantly, the soon to be reported holes were drilled after the results from the Company’s blockbuster hole were known. So, they were targeted based on valuable information. Therefore, I think there’s a decent chance of additional strong assay announcements between now and the end of the year. Eric Sprott is invested in 3 GT plays, Garibaldi, Metallis Resources and Aben Resources. He knows precious metals better than most and knows the GT extremely well. 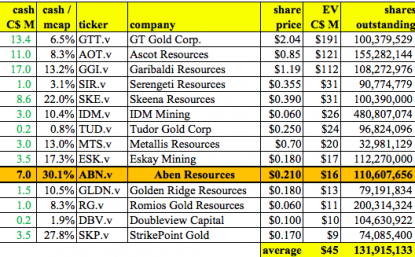 Mr. Sprott chose Aben Resources over several others he could have backed this year. Importantly, Mr. Sprott invested recently, in August, 2018 and paid C$0.30 per share + warrants at C$0.45. Today readers can buy into Aben at a 30% discount to Eric Sprott’s cost basis. Someone like Sprott’s group, investing at an early-stage (Just 2 drill seasons in) is likely looking for a pretty large return (commensurate with the substantial risk). 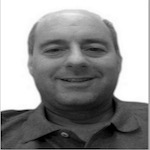 A quick note on Aben Resources’ management & Board. I argue that this a pretty strong team for a company that’s funded for next year’s drilling in the Golden Triangle and has an Enterprise Value under C$20 M. For instance, Chairman Ron Netolitzky is, without question, one of the most important modern day figures (dating back to the mid 1980s) in the history of the Golden Triangle. In addition to Forrest Kerr, Aben has 2 other promising projects, also in Canada. The Chico Project in Saskatchewan is near SSR Mining’s Santoy & Seabee deposits, and the Justin Project is located in the Yukon adjacent to Golden Predator’s 3 Aces Project. 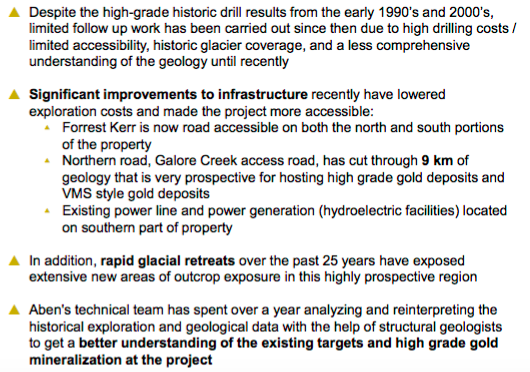 Assuming those projects are worth a combined C$5 M, that means Aben’s Forrest Kerr project alone is valued at (market cap – cash + debt – value of other projects) = ~C$11 M. That valuation seems quite attractive, especially for a company that’s fully funded for a robust drill campaign in the GT next year. Think about that C$11 M valuation (for Forrest Kerr alone), that’s a cheap option on a potential development project in the heart of the GT. Please note, Aben did not recently pile into this area play, staking any available ground it could find on the fringes. Management prudently assembled, over a period of nearly 3 years, what it believes is a highly prospective property, consisting of a good-sized land package of 23,400 contiguous hectares. Compare that C$11 M to the valuation GT Gold’s main project Tatogga, a 43,100 hectare property (about twice the size of Forrest Kerr). If one backs out that company’s secondary project, Tatogga has an EV of roughly C$180 m (~16x that of Aben). To be fair, Tatogga has way more drilling on it than Forrest Kerr, for example doing about twice the amount of drilling (18,000 m vs. 9,900 m) in 2018. Aben is still in the early stages of drilling the first of many targeted zones. Earlier stage, more risk, but more potential return? Make no mistake, GT Gold is well ahead of Aben and warrants a significant premium, I’m not trying to compare apples to apples. But, Aben has 24 assays remaining to report this year and is funded for 60 or more holes in the GT next year. I think some high-grade hits with good interval widths could begin to close the valuation gap with larger peers. In all the talk about the prospects of the GT, it’s noteworthy that there’s been some real excitement around discoveries there despite a lackluster underlying gold price (in USD). 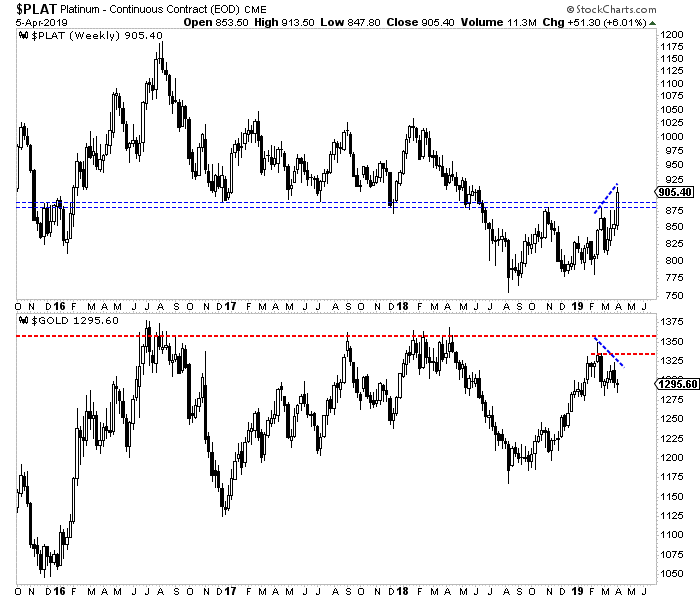 If one is bullish like I am on gold, a level of say US$ 1,350/oz (+10% from today’s price) next year would do wonders for all gold stocks, but perhaps no other group would benefit more than the GT juniors. Disclosures: The content of this article is for information only. Readers fully understand and agree that nothing contained herein, written by Peter Epstein of Epstein Research [ER], (together, [ER]) about Aben Resources., including but not limited to, commentary, opinions, views, assumptions, reported facts, calculations, etc. 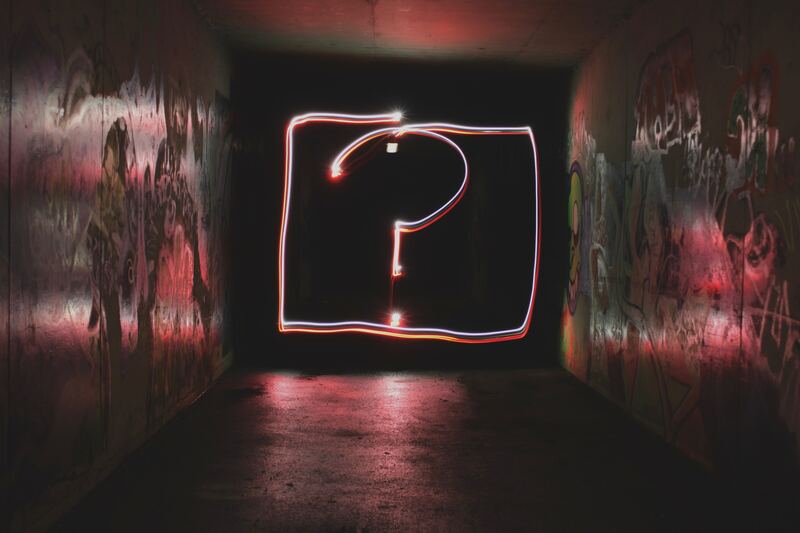 is to be considered implicit or explicit investment advice. Nothing contained herein is a recommendation or solicitation to buy or sell any security. [ER] is not responsible under any circumstances for investment actions taken by the reader. [ER] has never been, and is not currently, a registered or licensed financial advisor or broker/dealer, investment advisor, stockbroker, trader, money manager, compliance or legal officer, and does not perform market making activities. [ER] is not directly employed by any company, group, organization, party or person. The shares of Aben Resources are highly speculative, not suitable for all investors. Readers understand and agree that investments in small cap stocks can result in a 100% loss of invested funds. 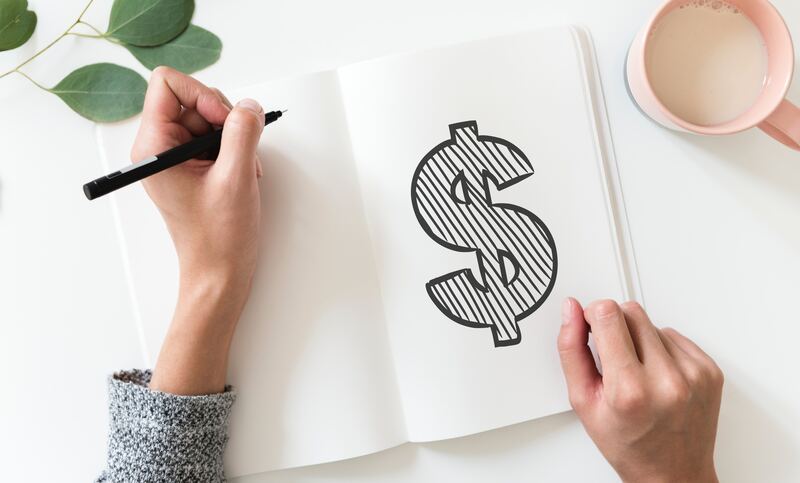 It is assumed and agreed upon by readers that they will consult with their own licensed or registered financial advisors before making any investment decisions. At the time this interview was posted, Aben Resources was an advertiser on [ER]. Readers understand and agree that they must conduct their own due diligence above and beyond reading this article. 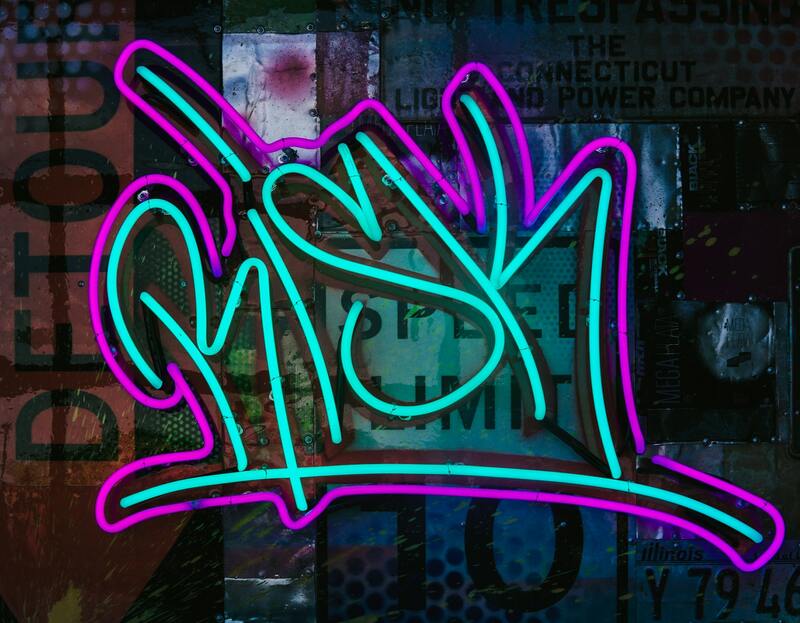 While the author believes he’s diligent in screening out companies that, for any reasons whatsoever, are unattractive investment opportunities, he cannot guarantee that his efforts will (or have been) successful. [ER] is not responsible for any perceived, or actual, errors including, but not limited to, commentary, opinions, views, assumptions, reported facts & financial calculations, or for the completeness of this article or future content. [ER] is not expected or required to subsequently follow or cover events & news, or write about any particular company or topic. [ER] is not an expert in any company, industry sector or investment topic.